RAISING THE ROOF. The iconic topper of Woo’s Pagoda Restaurant was salvaged in May 2014. The Chippewa Valley Museum is racing against time to find a home for an iconic remnant of a Chinese restaurant it salvaged three years ago. Last month, the museum announced that it will end efforts to restore an 18-foot-tall roof structure from Woo’s Pagoda Restaurant unless it can find storage for it by May 15. While a local business, Live in Eau Claire, has offered to fix up the pagoda, an indoor space large enough to house the architectural remnant during the restoration is needed, said Carrie Ronnander, the museum’s director. While a “likely spot” has been found, as of the end of April an agreement to store the pagoda there hadn’t been reached, she said. 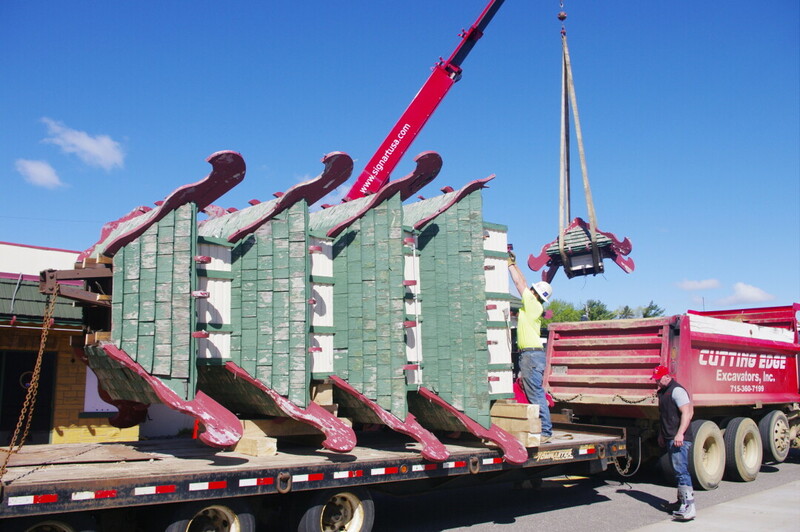 The pagoda – a wooden structure over a steel frame that was erected atop Jimmy Woo’s Restaurant in 1959 – was salvaged by volunteers in May 2014 when the former Hastings Way restaurant was demolished to make way for a CVS Pharmacy. Since then, the pagoda has been stored next to Banbury Place – you may have spotted it next to the former tire factory on Galloway Street – awaiting repair. Three years ago, the pagoda was in fair to poor condition, and since then it’s continued to deteriorate, Ronnander said. “We have hit quite a few dead ends in our private search, so we wanted to get some public input,” she said of the deadline announcement. Live in Eau Claire, a real estate and rental business that also owns the Local Lounge, has offered to restore the pagoda and display it outside the Local Lounge. However, if indoor storage isn’t found by May 15, that plan will be set aside and the pagoda will be dismantled. According to the museum, if that occurs, a small top section of the structure will be removed and repaired.